These lush lavender roses and crisp white lilies are poised to please! Perfectly presented in a stylish cube vase, it's an any-occasion surprise they'll never forget! Purple Spray Chrysanthemums, Lush Greenery and more. Standard Arrangement Measures 13" x 14". Pleasing Purple Bouquet is a hand delivered gift. These gifts are delivered by one of our local design centers located throughout the United States and Canada. Same day delivery is available for most gifts when ordered before the cutoff time. 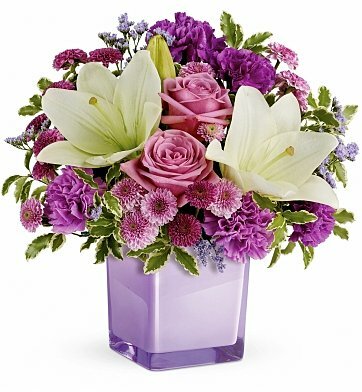 The cutoff time for Pleasing Purple Bouquet is 2 PM in the recipient's time zone.